Handmade top in thin stretchy pink jersey and pale neon pink paisley patterned jersey for the sleeves. Long sleeves, and low back neckline. By buying this creation, if it is not on sale, you can collect up to 5 loyalty points. Your current cart will total 5 loyalty points that can be converted into a voucher of 2,50 €. Handmade top in thin stretchy pink jersey and pale white and pink patterned jersey for the sleeves. Long sleeves, and low back neckline. Shown worn with a high waist white and pink plaid suspender skirt. Handmade top in supple teal blue jersey and black &amp; blue geometric print jersey for the sleeves. Long sleeves, and low back neckline. Limited edition. Handmade pale blue and white top in vintage checkered jersey and pale blue mesh. Long sleeves gathered at the wrist and low back neckline. Limited edition. 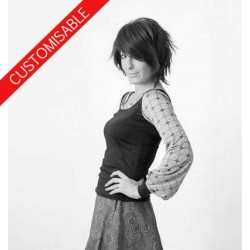 Handmade top in supple black and grey lace print jersey, with short sleeves and a low back neckline. Limited edition. Handmade top in black cotton jersey and black &amp; white zebra print jersey for the sleeves. Long sleeves, and low back neckline. One of a kind. Handmade top in solid purple jersey and thin grey jersey with purple and pink pattern. Long sleeves gathered at the wrist and low back neckline. One of a kind. Handmade green and light brown womens short-sleeved top with low back neckline. One of a kind. Handmade long A-line winter coat, in beige and white wool and raised velvet, with long sleeves and a round hood. Limited edition of 2.